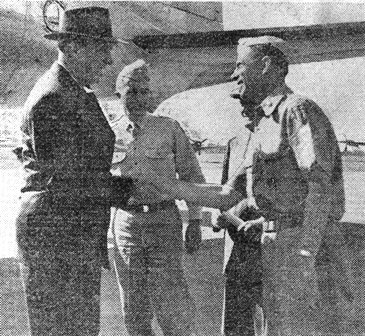 UNDERSECRETARY IN DELHI Undersecretary of War Kenneth Royall (left) is greeted at the New Delhi airport by (left to right) Maj. Gen. Vernon Evans, Acting Theater Commander; George R. Merrell, American Commissioner in India, and Brig. Gen. W. O. Reeder, Field Commissioner of the Foreign Liquidation Commission. The Royall party is on a world-wide tour. Half Of June Group Starts Home In April Roundup Staff Article More than half of the June 30 eligibles, who had not been scheduled for release from their organizations until after April 30, will sail for home during the month of April, Roundup learned this week. April troopships have a capacity of approximately 6,400 spaces. Only 2,600 April 30 eligibles remain in the Theater. Thus space remains available for about 3,800 returnees. The number of June 30 eligibles totals roughly 5,800. Theater Headquarters spokesmen said that the June 30 eligibles would be released and sent home during April as quickly as there was no longer any military need for their services. The June 30 standards for release as previously laid down by I-B Headquarters are 40 points or 24 moths of service as of June 30. It was anticipated that the bulk of the April 30 eligibles would be cleared out of the Theater with the sailing of the General Sturgis on April 13, while the General Hersey on the 21st would carry most of the June 30 group going in April. Theater personnel also includes 4,300 men not eligible for release under the June 30 criteria. Since only 450 men will be sent to China from this group, the closing of the Theater on May 31 will mean return home for 3,850 men who would not have been eligible otherwise. Delhi area and Theater Special Troops (incomplete) - 257, Base Section (incl. Assam) - 3,558, AAF, I-BT - 882, ATC, AACS, 10th Weather - 829. CALCUTTA - Her decks packed with more than 3,000 G.I. 's, nurses, Red Cross personnel, wives and WACs, the SS Marine Cardinal backed away from Pier 2 of the King George V docks here last Saturday afternoon after one of the quickest "turnarounds" in the history of Port of Calcutta troop embarkation. AIN’T SWEATERS GRAND Charming Leslie Brooks, who came from Omaha, Neb., to Hollywood to make a name for herself, has succeeded very well. The lovely Leslie is credited with having the most shapely legs in the Cinema City. They're sooooo right. Lines were cast off and the 12,000-ton vessel moved stern-first into the muddy Hooghly channel in mid-afternoon, scarcely more than 16 hours after tying up here late Friday evening. Aboard her were slightly over 3,000 officers and enlisted men, five enlisted WACs, 23 wives of American servicemen, 13 nurses and 42 Red Cross personnel, most of them women. The merchant crew aboard numbered about 100. The Cardinal was the second U.S.-bound troopship to sail from Calcutta in four days - her sister ship of the MacCormack-Moore Lines, the SS Marine Jumper sailed on Wednesday, March 20, with 3,100-odd male passengers aboard. Arriving off the mouth of the Hooghly, 60 miles from the King George Docks late Thursday, the Cardinal was delayed nearly 24 hours by pilot difficulties. She docked at approximately 10 o'clock Friday evening. Rushing crew members and Army Transportation Corps personnel worked through the night to get the vessel ready for the 25-day voyage to San Francisco, and the first homeward bound servicemen stepped aboard at 6 o'clock Saturday morning. Unlike the enlisted men and male officers, the women were allowed to have their luggage carried on the ship by coolies. First to board were the nurses, followed by the quintet of WACs. Then came the Red Cross girls and a handful of male Red Cross workers, followed by the 23 wives. There were no babies on the passenger list. Crew members estimated the trip to San Francisco would take approximately 25 days, with a refueling stop at Manila. 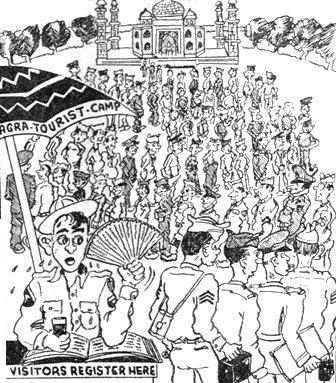 Roundup Staff Writer It is anticipated that the India-Burma Theater will close out by May 31 and possibly a little earlier, leaving behind not more than 500 military personnel for graves registration claims and similar work. Undersecretary of War Kenneth Royall declared in a press interview during his visit to New Delhi last week. Royall said the 500 remaining would be progressively reduced, and after a few months the number should not exceed 100 or 150. Thomas B. McCabe, Foreign Liquidation Commissioner, and Maj. Gen. Floyd L. Parks, chief of the Army's Public Relations Division, also took part in the interview. Seven other top Army officers were in Royall's and McCabe's party, including Lt. Gen. Leroy Lutes, Commanding General of the Army Service Forces. Royall explained that the principal aim of the party's world-wide inspection tour was an examination of the disposition of Army surplus property in all theaters. The Undersecretary declared that India-Burma Theater had done an outstanding job - one which was "truly remarkable" in the circumstances of reduced personnel. He declared that surplus property in the Pacific areas was still widely scattered, but he found I-B surpluses well warehoused in Calcutta, the principal storage point. Royall stated that he had been informed that the warehousing and record-keeping was in similar good shape in other parts of the Theater, although he had not visited them. McCabe confirmed the estimate, which appeared in Roundup last week, that all but "tag ends" of the surplus property in India would be transferred to the Indian government by about April 25. He said the tonnage involved would amount to half a million. Royall declined to venture any opinions on recent controversies concerning freedom of the G.I. press, on grounds that he had been away from Washington, traveling, while most of the incidents took place. 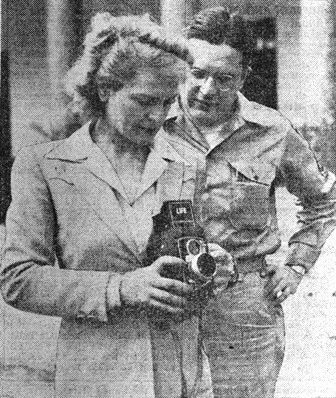 Royall was asked whether he knew anything about reports that American insignia was still being used on Lend-Lease equipment in Indonesia, in violation of President Truman's request. He declared he was not personally familiar with the situation. "I don't say it doesn't exist," he stated, but added that this was the first time the question had been asked him. McCabe, in response to a question concerning sale of Army and Navy property in Australia to the Dutch for use in Indonesia, confirmed that military property is being sold to them. He said the sale was not proceeding as fast as we would like. He confirmed that material bought by the Dutch is being transported in Army and Navy ships and in U.S. vessels under the War Shipping Administration. The FLC Commissioner said that material from this Theater previously committed to China under Lend-Lease will be turned over to China. McCabe declared that there is in Calcutta now a stockpile of 35,000 tons, worth about $23,000,000, waiting transportation to China. The tonnage includes 5,571 vehicles, he said. While in New Delhi, the party called on Air Marshal Carr, acting British Commander-In-Chief; met with Viceroy Wavell; were entertained at lunch by George R. Merrell, head of the American Mission in India; and were the dinner guests of acting Theater Commander, Maj. Gen. Vernon Evans. From India, the group is expected to proceed to Africa and Europe before returning to Washington. NEW DELHI - (UP) - A mission of three British cabinet ministers arrived here by air last Sunday to begin discussions leading to the determination of the political fate of India's 400,000,000 people. The members will consider, in conjunction with Indian leaders, whether India should become a completely independent nation, a self-governing component of the British Commonwealth of nations, or be divided into separate Moslem and Hindu states. When the Marine Adder pulls out of King George Dock about May 3, 2,050 I-B troops aboard will be dreaming of Shangri-La - old San Francisco, but Shanghai will be the destination of about 450 other Army personnel among the passengers. With the naming of the first May boat this week, also came detailed news of the shipment of I-B troops to China. Altogether, 122 officers and 424 enlisted men have been requested by China Theater from India-Burma, Roundup learned. The China-bound enlisted men will all come from the ranks of 4,300 I-B G.I. 's who are not eligible for discharge by June 30. It is expected by Theater Headquarters that the 122 officers can be found in the ranks of Regular Army men and volunteers. Forty-four officers have already gone to China. Among enlisted men, it will be mainly Signal and Medical personnel who will be chosen for the China assignment, while the biggest demand for officers is among Engineer and Signal categories. The Marine Adder, which has now been designated as the first May boat, has a total capacity of 3,292. The War Department has allotted India-Burma 2,050 spaces and has given 1,200 spaces to China Theater. The Adder will dock at Shanghai where it will disembark the 450 and load 1,200 personnel designated by China Theater. The Adder is scheduled to hit Shanghai on May 15 and San Francisco on June 6 - making the trip to the U.S. in 32 days. Latest information on the April boats is that the sailing of the General Sturgis for Calcutta from San Francisco has been delayed three day. The Sturgis is now expected to sail from Calcutta on April 15, instead of April 12. The General Hersey is still due on April 21. The General Hase, and the General Ballou, which left India for Seattle in February, were rerouted on the way, and docked at San Francisco instead. NEW DELHI - Thousands of United States Army troops have left India and soon all of the American soldiers will be gone. As the curtain falls on the G.I. in India, it is only natural that we wonder what impressions we have left with these people of a foreign land - 12,000 miles from home. So your Roundup artist got busy on the reportorial side and conducted some interviews among young women in the Delhi area, girls who should know the G.I. pretty well because they have dated the Americans many times. An effort was made to get a cross-section of G.I. dates - popular girls of British, Anglo-Indian, Chinese and even Parsi descent. The question was "What do you think of us?" The girls were urged to be utterly frank. They responded that way. The general opinion they held toward G.I. 's - who have been in the India-Burma Theater since 1942 - was that we are a pretty good sort . . . generous, friendly, bombastic, frank and wolfish. We are not as good dancers as we think we are. Our sense of humor, say the girls, is superb. ROSHAN DARWUALA, 23, a Red Cross worker who was born at Cawnpore, United Provinces, said: "It's difficult to form an opinion on the inhabitants of a nation so great and varied, but on the whole it is favorable. Of course, one does meet the 'corny' specimen now and then. (She glanced at the interviewer when she said that.) But I always said 'salaam' and took my walking ticket when I met that kind. No matter what you say, he'll still think he knows it all." Is there anything in particular the people here dislike about the I-B "invaders?" Generally speaking, the girls said that the Yanks take a lot for granted when they get acquainted with a person. And there is too much talking about America. The United States is a great country. Brooklyn and Providence are fine cities, but they do wish we'd stop bragging about the native land. CYNTHIA SMITH, 20, a New Delhi girl and secretary for the Foreign Liquidation Commission, elaborated, "Individually, there are a lot of things one may not like about G.I.'s. In the main, they drink too much. I don't know if they are accustomed to consuming the vast quantity of liquor they do here or it is just due to the fact they are away from home, friends, and so forth." RUBY CHEN, 26, of Canton, China, now working with the Graves Registration Service here, declared in response to a question about improvement among G.I. 's: "For the G.I. overseas, I'd say take it easy. Have fun, but the right way. Most girls in the Orient are not like those in the United States in that they have lived a restricted life. We are not accustomed to the States' idea of companion ship, having fun and all that." Other suggestions for improvement from the other girls included: Stop chewing gum madly; quit running words together in conversation; stop handing out "lines" and take a course in six easy lessons on "How To Sum Up A Girl." Are the Americans fast? The consensus is "yes." LEE WILLIAMSON, 21, of London, England, a volunteer worker with the Red Cross in New Delhi, was an exception. She didn't find the Yanks especially hard to handle because of their "speed." But DULCIE MOLLAN, 21, a WREN from South India, found the boys rapid. So did DELPHINE CARPENTER, 20, of Old Delhi, a lance corporal in the Indian Women's Army Corps. The girls were asked about their impression of the way soldiers wear their uniforms. VIOLETTE CHEN, 23, another secretary from Canton, China, employed in the Civil Employment Section, concurred with most of the others queried by saying the Americans are mostly clean and neat. SGT. MELVIS PEYTON, 21, WAC(I) from Old Delhi, remarked: "They are almost always dressed neat and take extra pains to keep that way." Cynthia disagreed, saying the winter uniforms look all right, but the summer garb make more than 50 percent of our soldiers look "slouchy and grubby." Roshan and Lee, too, thought the G.I. 's should do better with all the facilities for neat dress afforded them. "Their pants usually are too small or hang funny," said Roshan, "As for their headgear - need I say more?" How are the G.I. 's in regard to conversation? Violet said: "In conversation they are bright and can always keep it going, but most of the time they are kidding and sometimes don't even know what they are saying. But they are intelligent and pretty well informed on foreign affairs." Cynthia expressed herself: "The boys with whom I've made friends and not just acquaintances are most interesting conversationalists and you look forward to seeing them again." Lee said "interesting," Roshan said "terrific - only I wish I could understand them better." The other girls agreed they liked the American lingo. Your reporter inquired about the young women's opinion of our manners or lack of same. "Manners of the G.I. 's are usually super," announced Ruby. "They treat the ladies like queens - young and old. They know the rules of etiquette. However, they sometimes are rough toward other men." The other seven subjects of Roundup's interview put down our manners as anything from "mediocre" to "good." Melvia liked the idea that "the G.I. 's are obliging, always trying to make themselves useful and helpful." How about sense of humor? Without exception, the girls went overboard for the American sense of humor. Some went so far as to say it is the Yank soldiers' greatest asset. None of the eight were exactly sold on G.I. dancing ability. The general opinion was that we are just so-so on the dance floor. Dulcie said "fair." Violet's pronouncement was "not too good and not too bad." Lee and Roshan "hate jitterbugs." Ruby thinks we have a lot of "hep" in our feet but aren't so good at waltzing. Violet said the Americans know how to have fun and do not mix work with pleasure. Delphine echoed that sentiment. Dulcie completed the agreement when she said: "When it comes to having fun, there's hardly a dull moment when you're out with a G.I. on a date." And now, Fellas, you know what's wrong and what's right with us foreigners over here. VIEWS BUDDIES’ REMAINS Capt. 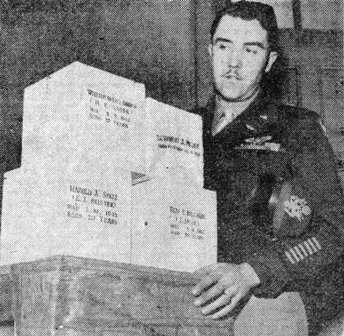 Chase J. Nielsen of Hyrum, Utah, Doolittle Tokyo bombing survivor of a Jap prison camp, looks at the boxes containing the ashes of four of his former flying mates at a Shanghai funeral parlor. Three of the men were executed by the Nipponese and one died of beri-beri in a prison camp. SIGNIFICANT REPORT Roundup here presents the report of General Marshall on his return to Washington from his mission to China. In view of the confused state of affairs in that country, this timely statement of American policy and the personal views of the general are of the greatest significance. progress being made in uniting that country, and of the importance of its unity to the world. "If the world wants peace," he said, "China's effort must succeed, and that success will depend largely on other nations." "The Chinese people are engaged in an effort which, I think, should command the cooperation of the entire world. It is an effort almost without precedent. Their leaders are making daily progress towards the settlement by peaceful discussions of deep-seated and bitter conflicts over the past 20 years. "They are succeeding in terminating the hostilities of the past 20 years. They have reached agreements and are n ow engaged in the business of demobilizing vast military forces and unifying and integrating the remaining forces into a national army. They have agreed to the basic principles for the achievement in China of political and economic advances which were centuries in coming to the western democracies. "If we are to have peace - if the world wants peace - there are compelling reasons why China's present effort must succeed and its success will depend in a large measure on the actions of the other nations. If China is ignored or if there is scheming to thwart the developments of unity and present aspirations, their efforts inevitably will fail. "The United States, I think, at the present time is best able to render material assistance to China. I feel quite certain of the sympathetic interest of the American people in China, but I am not quite so certain as to their understanding or the understanding of their political leaders of the vital importance to the United States of the success of the present Chinese efforts toward unity and economic stability if we are to have the continued peace we hope for in the Pacific. "Incidentally, I do not believe any nation can find justification for suspicion as to our motives in China. We are asking for no special preferences of any kind whatsoever regarding economic or similar matters. We are placing no price on our friendship. I must say, though, that we have a vital interest in a stable government in China and I am using the word 'vital' in its accurate sense. are of great importance to us, not to mention what they mean to the Chinese people. "I have met on every hand the most generous reception, the most remarkable reception I might say, and it seemed to me a very understanding cooperation toward whatever efforts I might be making. The situation, of course, has been most complicated throughout my brief stay in China, first, by the disturbed conditions in this country as well as in the Pacific and then later by the critical state of affairs in Manchuria. Despite these difficulties I think tremendous progress has been made. "I would like to have you understand something of an organization that has been established in Peiping which we call executive headquarters. That is the most important instrument we have in China at the present time. Agreements are all very well, but you must have a means for carrying them out, particularly when they are intended to resolve bitter differences of large groups of people. "So we have in Peiping a headquarters consisting of three commissions, the chairman of which is an American, the other two members representing the Chinese Government and the Communist party. And then we have an American chief of staff, and under him is a group of about 250 officers. The core of the organization is American, with the representatives of the national Government on one side and the Communists on the other, and they are brought together with this framework of an American staff. "They are represented out in the field throughout the critical portions of China by little teams of three men, one American, one Governmental representative and one Communist representative. And the force and effect of these agreements and the detailed orders to carry them into effect in that way are carried down on the ground at the scene of the trouble - whether it is fighting, whether it is restoration of communications, whether it is relieving the encirclement of a city, the evacuation of Japanese or, as is now coming up, the demobilization, reorganization, and integration of the armed forces in China. "We would have gotten nowhere without that headquarters. It is absolutely essential in every step of the way in connection with these agreements which have application to the military situation, which, of course, includes communications. "Up to ten minutes before my departure from China we were reaching agreements regarding sending these teams into Manchuria. We reached a general agreement and they had certain details to work out after my departure. They should be on their way now. "it is of great importance that they get there as soon as possible. You must understand that it is exceedingly difficult, with the best intentions in the world, to transmit orders where there are very limited radio communications and almost no highway communications over these great distance in these isolated localities and where, in many cases, the forces are not well-knit, organized units. I found it necessary to make a trip of about 3,500 miles to the principal region where there was still trouble. I was accompanied by the Government representative and part of his staff and the Communist representative with part of his staff. "I found in the case of the latter, they had not yet seen some of the leaders for two years and had very limited communications with them from time to time. We were able to resolve almost every difficulty once we got the people together. It was very remarkable how quickly we could straighten out what seemingly were impossible conditions and which had their tragic effect on the Chinese people. A single conference of a few hours in an afternoon would raise the encirclement of what amounted to 10 or 12 besieged cities, where people were starving. It only took that long to straighten out, but until we arrived nothing could be done. "Now in Manchuria They have had no representative of the executive headquarters there up to this time. The situation has been very fluid, troops are moving here and there with, of course, all sorts of minor clashes occurring. There is no doubt whatever in my mind that in many instances, particularly on the Communist side, they are almost unaware of the agreements we have reached; therefore, it is most important that we have these teams in that country as quickly as possible. "I would like to say that the American officers in these small groups are rendering very remarkable service, not only under the difficult conditions of the task, but under extremely difficult conditions of life. I repeat again, that without the headquarters of the nature that we have established in Peiping, without its representatives, it would be literally impossible to carry out any of these agreements, even with the best intentions of the world at the top. "I saw General MacArthur in Japan and talked over with him the representation of Chinese troops in the army of occupation. He was very happy to have them and I think you will shortly read of an announcement by the Generalissimo to that effect." Asked whether Soviet troops had evacuated Manchuria, General Marshall replied that the United States did not have observers there but would have them shortly. He said the situation was extremely critical. 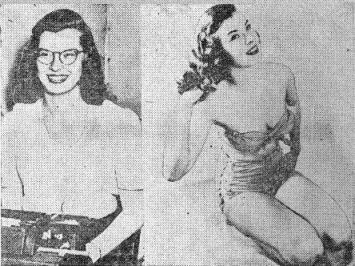 QUICK CHANGE ARTIST It's difficult to recognize bespectacled Wanda Ridgeway, the gal at the typewriter, as the same young lady who sits at right. But they're both Wanda, 19-year-old employee at Camp Grant, Ill. Asked to explain the reintegration of the Chinese Army, to compose both former Nationalist and former Communist forces, General Marshall said representatives of both forces are working with a group of U.S. Army officers who are aiding the demobilization program. In about one year General Marshall estimated the armies will include 60 divisions, of which 50 will be Nationalist and ten Communist. It probably would be further reduced later. He emphasized the magnitude of the entire demobilization program. In connection with discussion of the Chinese armies, General Marshall said that Nationalist forces, known as Alpha divisions and developed with American help, are now embarking for Manchuria. Leading units of these divisions were in Burma, he said, but had been marched over the Himalayan foothills in one of the largest troop movements in history. In reply to a question about the number of United States troops in China, General Marshall said that Army troops there now comprised a completely non-combatant force which is engaged in handling supplies to be turned over to the Chinese, handling and disposing of property and providing plane transportation essential to the functioning of the combined executive headquarters. Three military newspapers are published at The Statesman office in New Delhi; one is Roundup, another Contact, the British Army weekly, and the third, Il Corriere (The Courier) the newspaper for the approximately 35,000 Italian soldiers stationed in India. Roundup cornered some of Il Corriere's staff and this is what they had to say concerning the history of their countrymen in India and its environs. In September, 1940, Italian U-Boats captured in Indian waters brought the first POW's to what is now known as the South East Asia Command. The following Spring so many POW's were taken from Italian subs and corsairs that the Italian "immigration" into India had swelled to 55,000 men. The majority of these were veterans of Libya, fighting in the days of Lord Wavell, and the Axis Field Marshalls Rommel and Grazziani. They represented all branches of the Italian Army and even the Navy, whose crews were part of the captured vessels. Between 1941 and 1942, some 20,000 of these POW's left India to work on farms and factories in Australia and England. In September of 1943 the newly-formed Italian cabinet requested all the Italian POW's in Allied hands to become "co-belligerents" and assist in the defeat of Germany and Japan. About 30,000 of the POW's in India signed "Cooperator" papers and showed their faith in their new government by obeying its orders to help the Allies. Approximately 5,000, 3,000 of them officers, did not sign. Many of these were fascists as well as soldiers, often belonging to the Mussolini Milizia and similar organizations. Those signing the "Cooperator" paper were put at the disposal of the British forces in this area. A request for combat fighting was denied them but some 15 officers and 700 other ranks had formed an Italia Redanta unit under the British Army, even before the Italian armistice. Theirs was primarily a construction job. Some 20,000 of the remaining co-belligerents were organized into companies and battalions with a single British commanding officer of each unit and Italian officers subordinate to him and over the men. The Italians were dispersed all over India - to Calcutta, Bombay, Poona, Bangalore, Delhi, even Ceylon - and primarily employed in doing dockyard construction and carpentry work. For two years some 4,000 of them did airfield and dockyard construction work in Ceylon. When the Bombay docks had a major explosion in April, 1944, Italian co-belligerents worked for a year to clear the wreckage and rebuild. An Italian naval salvage corps concerned itself with raising the sunken "Santhia" which had burned at its dock in Calcutta's Hooghly River. Other groups are doing line construction jobs for the British Signal Corps. "Murart" is an organization of 60 Italian painters employed by the British to decorate their canteens and clubs throughout India. Its roster of officer-painters include a few really prominent artists of pre-war Italy. Maestro Fumi of Rome's Teatro Reale dell'Opera is now Capt. Fumi of an all-officer orchestra which plays for British troops up and down India. Former Italian physicists now operate precision instruments in aircraft work and one of their number was a student of Enrico Fermi, a leading scientist connected with work on the Atomic Bomb. LOOKS FISHY Linda Christian displays perfect form as she reels in a lone fish on a Los Angeles wharf. Indian embellishments. They sell them to Allied troops and are thus able to augment their income. The Geneva Convention stipulates that the victorious power must provide food and housing for all POW's to the same degree as that provided British personnel. In addition, Italian other ranks are issued clothing and a weekly allowance, varying between five and six rupees. Officers are given one-third of their regular pay and one-third of this (or one-ninth) is paid to them in cash. The Italian government is saving the remainder for them when they are repatriated. A 2nd lieutenant receives 63 rupees a month in cash and his credit in British military shops. Men keep in good health through frequent outdoor exercise, particularly football. This is especially important for the 10,000 men who signed the "Cooperator" paper, but who have never been given jobs. There has been no need for the skills they can provide (8,000 of them are officers) and they have been languished in camps for the past five years. 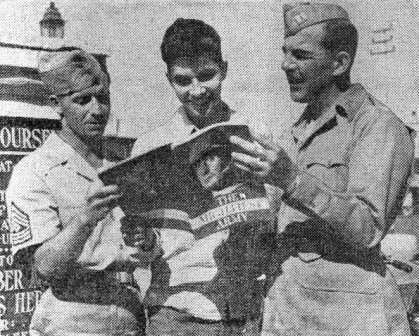 To keep the men informed and to prepare them for participation in their country's reconstruction once they are repatriated, the Italian soldiers hear news broadcasts twice daily over All-India Radio and the weekly four-page newspaper, Il Corriere, reprints the homefront views of all of Italy's political factions. A British captain is in charge of Il Corriere and has an Italian staff under him. Naturally, the immediate goal of all the Italians in India is repatriation. Since last December, several thousand of their number have been evacuated on British ships. These included the sick, wounded, those over 50 years of age and the generals. The highest ranker of the lot was Generale D'Armata Pietro Gazzera, a four-star Army commander. Many of the top brass were hustled off to Italian jails as soon as they landed because their military records were in too close a harmony with Mussolini's political policies. The Italian soldiers interviewed don't expect miracles when they do go back. "We know it will take a long time to rebuild Italy," they said, "and although our will is strong, we must have the way." According to the Italian newspapermen, Italy relies particularly on help from the U.S. and the most urgent assistance is needed in supplying their country with more ships, coal and iron. Knowing Italy to be vastly overcrowded, they are all for encouraging Italians to emigrate, but still think they should remain Italians in nationality. One of them said most Italians who are thinking of emigrating want to go to the Argentine, Brazil, Belgium, France and the U.S.
"All of us want a new and better Italia," Il Corriere's men concluded. 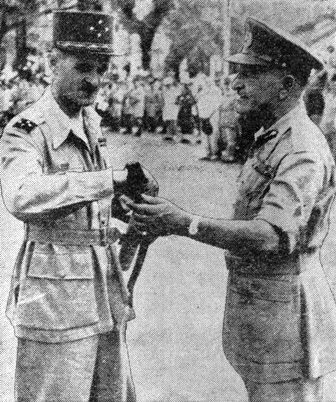 ALLIES IN INDO-CHINA At Saigon, Maj. Gen. D. D. Gracey, head of the Allied Control Commission in Indo-China, presents General Le Clere, C-in-C of the French Forces in the Far East with a surrendered Japanese sword. The general's gift was turned over to the British in Burma. Roundup Staff Writer SINGAPORE - Not much news came from Siam during the war. People had a vague idea that after being overrun by the Japs early in the war, the little independent country had become a passive Axis partner. But with war's end came the hints of one of the most amazing episodes in history: how right under the Jap's noses, American and British secret agents had established a country-wide intelligence system; set up 16 guerilla training centers within Thailand; secretly dropped 176 tons of guerilla supplies - all with the clandestine support of Luang Pradit, Siam's regent, the Thai police, and the Thai army. Actually, by V-J Day, American agents of OSS had established themselves in Bangkok's Palace of Roses - headquarters of Siam's Criminal Investigation Division! The broad outlines of the story have been told to the stateside public by now. Thai leaders, caught abroad after the Jap invasion, wanted to organize a Free Thai movement outside Siam, then establish contact with whatever underground existed in that country. British and American assistance were soon forthcoming. Secret operators were trained in the U.S. and England. Yanks and Englishmen too, were trained for infiltration by land, sea and air into Thailand to work with the native underground. First contacts within Siam were established in early 1945 when a small party, starting from Szemao, a 14th Air Force base in China, infiltrated it's way south into Siam. From Ceylon, coordinated American and British plans called for the infiltration of agents into the country by flying them to a secret island seaplane base in the Gulf of Siam, then worming into Jap-held Bangkok by motor launch. Some jumped and eventually it was possible even to land C-47's at Pukiao, a training center of the Thai Air Force! From here operatives were flown into Bangkok municipal airport by Siamese pilots, often in planes given to the Thais by the Japs! Now, from headquarters of Strategic Service Unit Detachment 404 (OSS' new post-war name) come some intimate, often grimly humorous details of the astounding operation. One of the first groups to enter Bangkok via the Gulf of Siam route was headed by Maj. Richard Greenlee and Maj. John Wester. On entry into the city, they were escorted by the Thais to a palatial residence on the waterfront. Their next-door neighbor was Luang Pradit - the regent of Siam himself. Operators in Siam maintained regular contact with the outside world. How did they do it? Simple. A captain of the Royal Siamese Navy built a secret transmitter ten miles outside of Bangkok, and established a remote control line from Allied Headquarters to the transmitter. In July of 1945, the highest admiral of the Thai Navy conducted American and British agents on a motor tour of his country's main naval base, so they could get first-hand information to help an Allied invasion. One of the narrowest escapes took place in the summer of 1945 when two Americans, Lloyd George and Lt. Col. Nicol Smith, were flown into Bangkok by the Siamese. As soon as their plane touched the ground, Jap ground crew members swarmed all over it and pulled the ship into a hangar. George and Smith, hiding in the cabin, were still undetected. Then came the problem of how to get out of the plane without being seen. The Thais simply called for a government vehicle, drove it flush against the plane and the two Americans were slipped quietly into the city. Allied operators living in Bangkok were furnished with elaborate meals, catered by the best hotel in town as "guests" of the Siamese government. It was not only high government officials but the ordinary citizen of Bangkok who was staunchly pro-Allied too. Majors Palmer and Greenlee had been living for several months in what they had supposed to be an unknown hideout in a fine residential area. One day the servants, as usual, went out to purchase fruit from a street peddler. Said the peddler in a friendly spirit, "My - those Americans you have living in your house eat a lot of fruit, don't they?" LESSON NUMBER TWO Zorita, shapely burlesque queen, continues with lesson number two in the study of angles. With all that she could write a book, hmmmmm? At one time, a C-47 was on a mission dropping Thai agents into the country. All the Siamese made their jumps. Fifteen minutes later, the static line was pulled in. Dangling at the end of it was a Thai radio operator - whose chute hadn't cut free! The very next day this Siamese, who had been pulled through the air at the end of a thin rope for 15 minutes, at 150 miles an hour, volunteered to jump again. An RAF plane loaded with underground operators was shot up badly by Jap fighters near Takli. Crew members tossed out four cargo chutes. The Japs saw the chutes, reported that four crew members had jumped and landed. Meanwhile the ship crashed. Survivors were spirited into Bangkok in buffalo carts and sampans by the Thai Police General. Since the Japs thought four men had parachuted in, the Thai police regretfully went through the formality of interning four of the crew. The rest were speeded on their way back to the 142nd General Hospital in Calcutta by the Siamese police force. After the atom bomb, but before the official surrender, secrecy was thrown to the winds inside Bangkok. Although the Japs had not yet surrendered, C-47's were flown directly into the Bangkok airfield. Inside the city, American and British agents emerged from hiding, and strolled down the city's main streets clad in full formal uniform, glittering medals and all! No one ever denied that the Japs played a pretty clever game in Southeast Asia. But little Siam, who for centuries has maintained a precarious independence sandwiched in between great powers, made them look like blundering amateurs. OFF TO SINGAPORE Roundup has "borrowed" Sgt. Louis Onofrio of the Theater Public Relations Office to "cover" the American war crimes trials starting in Singapore this week. A veteran newspaperman, Lou will bring to Roundup some of the on-the-spot color and drama concerned as the U.S. Army starts the first of its prosecutions of Japanese war criminals in the I-B Theater. now been referred to trial, and the first trial is on the docket in Singapore for this week. Murder will be the charge in the first case. W/O Tomano Shundo will be tried for the beheadings of American airmen in Saigon, Indo-China, survivors of a flight from the Philippines. The charge in the second of the three cases is also murder. The defendant is Lt. Suzuki Akaro, who is accused of responsibility for the execution of six Navy airmen in Pie Tonan, Indo-China. The third case involves the death of four American fliers and one British soldier in the New Law Courts Jail annex in Rangoon, following an escape attempt. The first two cases will be held in Singapore, while the Rangoon case will be tried in that city. Spokesmen for the I-B War Crimes Section estimated that there would be at least two more wholly American cases referred to trial and several more involving joint evidence with the British. All War Crimes Trials in this area are conducted by the British South East Asia Command. In cases involving American charges, the American I-B War Crimes Section prepares the evidence, then refers the case to the British Courts Martial for trial. The actual trial takes place after the British court authorities indorse the reference and place it on the docket. The actual trial is conducted by the British, with American officers acting as special assistant prosecutors when an American case is involved. Lt. J. W. Sands will be the American prosecutor in the Tomano Shundo murder case in Singapore. The South East Asia War Crimes trials began in Singapore in January. Altogether 48 war criminals have been tried so far, of whom 20 have been condemned to death and 20 more sentenced to terms of imprisonment varying from one year to life. The total of war criminals to be brought to trial is expected to be more than 500, according to British General Headquarters for India. ‘SLOPPY SHIRT’ Lovely Jill Meredith, who does unbelievable things for a "sloppy shirt," is abandoning Broadway for Hollywood - and a 20th Century Fox contract. 580 Patients Flown To U.S.
WASHINGTON - (ANS) - A perfect record in the flying of thousands of patients from the ETO and CBI by the AAF Air Transport Command in 1945, was reported recently by the War Department. A total of 43,496 patients, litter and walking, were evacuated from overseas over routes of ATC's North Atlantic Wing with only two deaths enroute, and in neither case could the trip be considered either the cause of or a contributory factor in the deaths. These figures take on additional significance, it was pointed out by the Chief Surgeon, when it is realized that a total of 186,747,436 patient-miles were flown during the year. The average distance traveled per patient was approximately 4,300 miles. Evacuations of the sick and wounded originated as follows: United Kingdom, 14,145; Paris, 24,166; Casablanca, 3,144; Naples, 646; India-Burma, 580; China, 401, other, 414. CALCUTTA - Down the long gangplank of the Marine Jumper last week stumbled 61 figures, wearing the khaki of the United States Army and a varied number of shoulder patches, the like of which have not been seen by local G.I. 's since they left the States. These 61 enlisted men are replacements for the troops in the India-Burma Theater eligible to return to the Zone of the Interior - some of them perhaps on the same ship which brought these new men across the broad reaches of the Pacific to the King George docks here. Mostly lower graders, the average length of service of the men who arrived here is about 11 months. There are a few veterans who have reenlisted, including one sergeant who has a record of five years in the Army and a substantial period in the ETO. Temporarily these replacements are stationed at Replacement Depot No. 3 where at present they are rubbing shoulders with tropic-weary veterans of the I-B in the process of being processed for return home. Unlike the experience of many men now in the I-B, the replacements had a quiet, easy crossing from the West Coast. They left Seattle on Feb. 18, as part of a total passenger list which was slightly over 300 persons. They said the trip was rough for the first few days but from then on everything was "very pleasant." The Jumper put in briefly at Singapore for fuel before coming on to Calcutta, but troops were not allowed to go ashore. Like the majority of the troops in the I-B, the men were given a two-hour orientation session the morning after they arrived here. Officials of the Repple Depple explained the "mission" these men are expected to perform and briefed them as to the dangers of disease. GETS ‘GREETINGS’ IN INDIA The long arm of Youngstown, Ohio, draft board stretched nearly 14,000 miles recently when John M. Balph took his pre-induction physical at the 100th Station Hospital in New Delhi. Registered with the Ohio board, Ralph was with his parents only a few months in Mussoorie, United provinces, when he received his notice. Above 1st/Sgt. Burtis Choat (left) and Capt. Donald McCullough, USF, IBT, Headquarters Company A commander (right), "orientate" Ralph on what to expect by showing The Mightiest Army. CALCUTTA - A lack of "central control" plus lowered morale among troops forced to spend long periods of idleness in Replacement Depot No. 3 areas were blamed this week for the continued spread of venereal disease among American troops in this area. At the same time, medical authorities here said that despite all precautions possible, certain numbers of troops have been reported as having been stricken with VD while aboard ships en route home after contracting it here. A Depot spokesman said this week that with the movement of the Depot from its previous location at Camp Kanchrapara to the site of the 142nd General Hospital and other areas closer to the city the VD rate among homeward-bound troops stationed temporarily in the Depot has risen over 400 percent. He said that when all elements of the Depot were at Kanchrapara, medical control of personnel was comparatively easy. Men going into the city on pass were "briefed" as to VD rates prevailing in Calcutta brothels and among the untold thousands of "pick ups" who roam the streets after dark. Upon their return to the Depot, all men were required to report to the dispensary where they were questioned as to the possibility of their exposure and were given treatment if medical authorities deemed it necessary. Men reporting back to camp under the influence of liquor were given such treatment automatically. NEW DELHI - Ordinarily, a birthday party is limited in attendance - limited by invitation or by accommodations or by reservations - but, when Armed Forces Radio Station VU2ZY celebrated its second anniversary last week every radio listener in the area was an honored guest. The "festivities" were in the nature of an hour program which told in narrative and dramatic from the story of Armed Forces Radio Service and its far-flung activities around the globe. It recreated and traced the origin and growth of a radio production, using flash backs and excerpts from some of the more popular of the Hollywood productions. Narrated by T/Sgt. Walter Flint of VU2ZY's staff, the program was written and produced by T/Sgt. Jim Woodruff, Jr. from an original story by T/Sgt. George Gingell, who is now homeward bound. The cast of players included Lt. Leonard M. George, Officer-in-Charge of VU2ZY; S/Sgt. Stan Cutler, the station's continuity chief; M/Sgt. Bob Greene, News Editor; T/Sgt. Frank Holober of the Theater I and E Section; and the following men of the Roundup staff: T/Sgt. Chet Holcombe, T/Sgt. Ed Alexander, and T/3 E. Gartly Jaco. Miss Barry Vendig of the Red Cross was the only feminine voice. Since VU2ZY expects to close within a few weeks, the program on the occasion of its second anniversary served a dual purpose - to tell its many listeners about the program which they have been hearing for the past two years and to bid farewell to the people of Delhi. Wilbur By Menutis Wilbur - "My mission continues!" Continued flow of supply items for which the I-B Theater is dependent on the Indian Government was assured this week, when the Theater received authorization from the War Department to procure these items from India on a monthly cash basis, with payment in rupees. The problem had arisen following March 2 when both U.S. and Indian governments announced the end of cash reimbursable reciprocal aid. Cash reimbursable reciprocal aid was the program which succeeded Lend-Lease for six months following President Truman's announcement of the end of Lend-Lease. Under cash reciprocal aid, the Indian Government and the U.S. had mutually supplied each other with needed items. Payment was to be negotiated between the two governments at a later date, as a part of the general settlement of war finances. 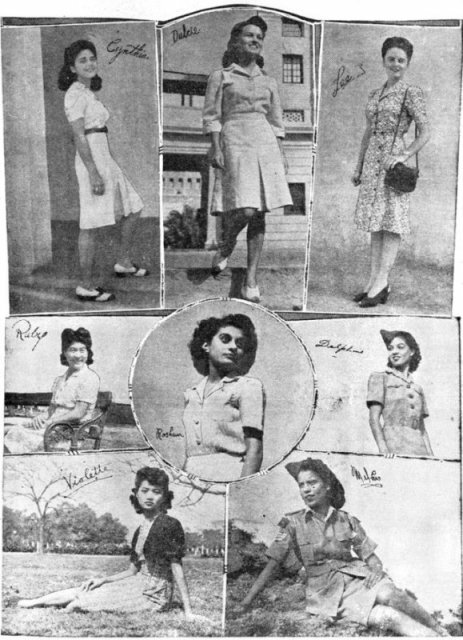 The U.S. Army in India received such items as buildings, fresh food, and unskilled labor from the Indian Government first under reverse Lend-Lease, and then under cash reimbursable reciprocal aid. When the cash reciprocal aid program ended on March 2, the problem of continuing these supplies arose. The Indian Government offered to continue to supply these items on the basis of monthly cash payments in rupees to be paid locally, rather than settled later on an inter-governmental basis as previously. The Roundup is a weekly newspaper of the United States Forces, published by and for the men in Burma and India, from news and pictures supplied by staff members, soldier correspondents, Army News Service and United Press. The Roundup is published Thursday of each week and is printed by The Statesman in New Delhi and Calcutta, India. Editorial matter should be sent directly to T/Sgt. Chester Holcombe, Hq., U.S.F., I.B.T., APO 885, New York, N.Y., and should arrive not later than Saturday in order to be included in that week's issue. Pictures must arrive by Friday and must be negatives or enlargements. Stories should contain full name and organization of sender. Complaints about circulation should be sent directly to Roundup Distribution Officer, Base Section APO 465, New York, N.Y. Units on the mailing list should make notification of any major change in personnel strength or any change of APO.